Once upon a time there was a tiny tropical island, an emerald drop of paradise wrapped in soft white sands, surrounded by a vibrant coral reef, lapped by warm turquoise waters and hidden in the heart of a UNESCO biosphere reserve. Milaidhoo is that island. That time is now and this is Milaidhoo's story. 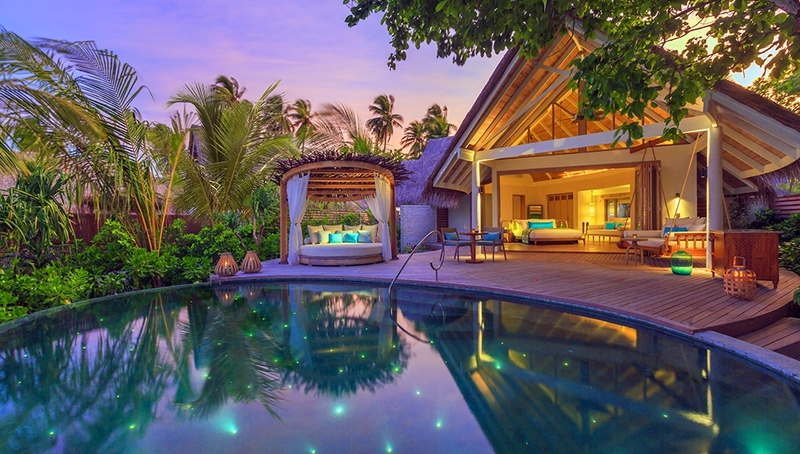 Not just another five star resort in the Maldives, Milaidhoo, like to do things differently: itâ€™s called reinvented luxury. 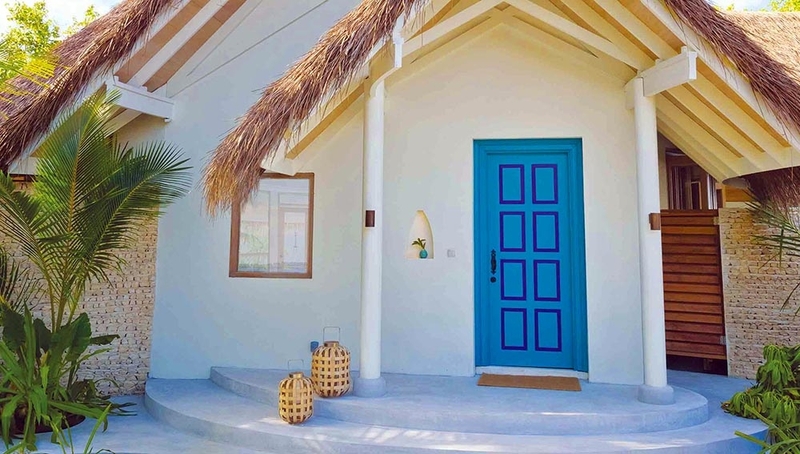 The guests are not just holidaymakers but as story writers, crafting their dream holiday, and this is where your story of a small island begins. 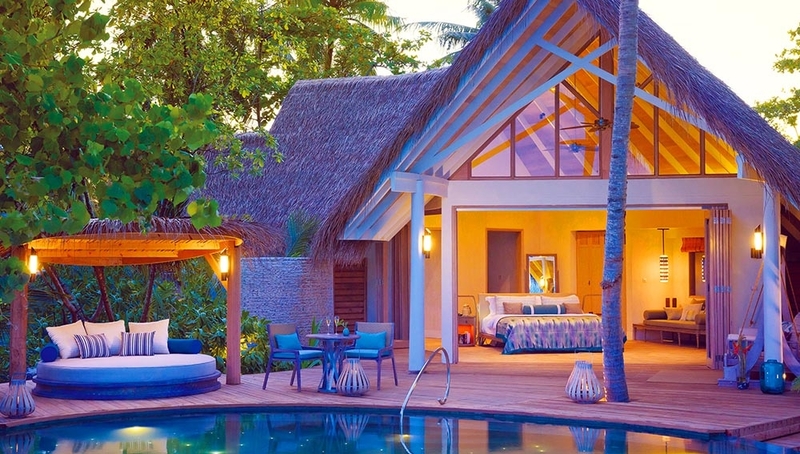 Opening in November 2016, Milaidhoo is a boutique luxury resort in the Baa Atoll UNESCO biosphere reserve, close to Hanifaru Bay, 126km north-west of Male. Perfect for nature lovers as the coral reef, which encircles the island, is a protected area and noted as an outstanding snorkelling and diving site in its own right. The tiny beautiful island, abundant with tropical greenery, measures just 300 by 180m and is fringed by soft deep white sand beaches. 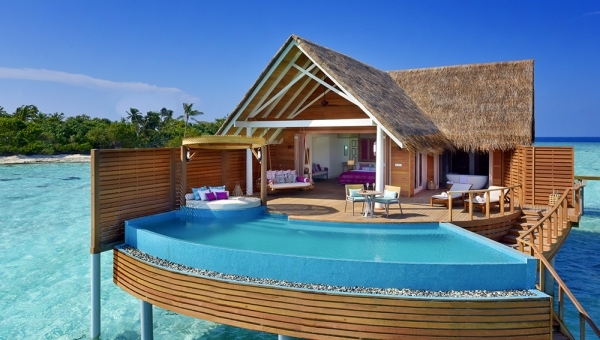 Designed for couples and honeymooners, they welcome guests aged nine and above. 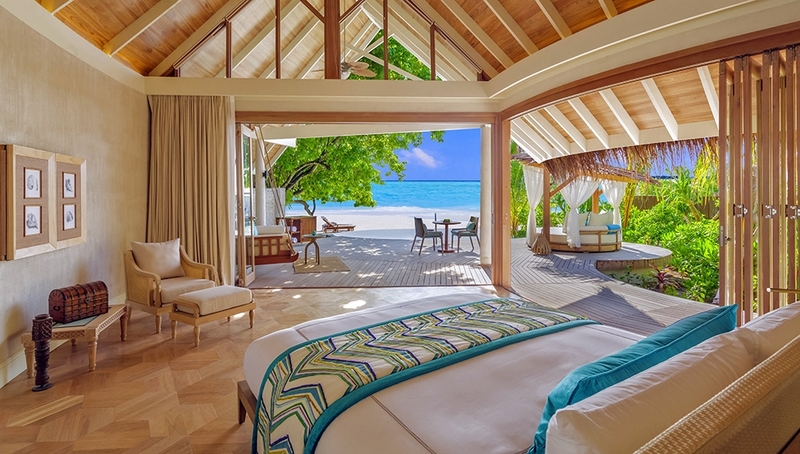 Everything at Milaidhoo has been custom made and made for comfort; crafted around your needs. Service is tip top but always friendly, in line with our â€˜barefoot informalityâ€™ ethos. Above all, theyâ€™re proud to offer a taste of the true Maldives, opening doors to Maldivian culture and unique experiences. Seaplane transfers only operate during daylight hours. Should you arrive in Male after 15.30, you will be booked on a 15-minute domestic to flight to Dharavandhoo airport followed by a 15-minute speedboat ride to Milaidhoo. The above-mentioned seaplane flight will have other hotel guests on board. If youâ€™d like to charter a seaplane for your own private transfer, it would be our pleasure to arrange it for you. Simply contact us for prices. 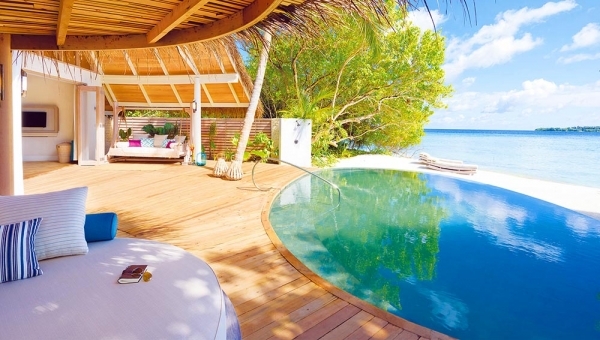 All villas offer: a large private freshwater pool on the sun deck; a hanging Maldivian swing (â€˜undhoaliâ€™); an outsize day bed; air conditioning and ceiling fan; ocean views; tea and coffee machine; oversized minibar; private wine fridge; flatscreen satellite TV; en suite bathroom with soaking tub and separate rain-shower; a full range of toiletries by Acqua Di Parma. Here youâ€™ll watch dolphins play on the surface of the turquoise ocean or visit Hanifaru Bay where â€“ in season â€“ manta rays, and whale sharks bask in the shallow warm waters of this UNESCO world biosphere reserve. 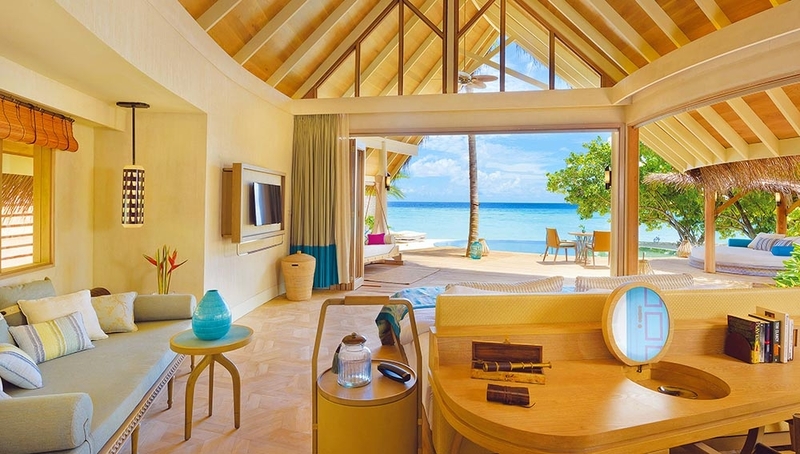 Here youâ€™ll snorkel our house reef alongside turtles, colourful tropical fish or maybe even a passing friendly shark. Or take a traditional Maldivian sailing boat and head off into the far horizon, exploring coral reefs and deserted islands, and only coming home when you want to. Laze by the infinity pool or do nothing but chill out on the beach and leave the busy-stuff to the hermit crabs and herons. Take the big game fishing boat for an exhilarating catch-and-release trip or learn from the local fishermen the traditional art of handline fishing. Dive deep into the ocean and discover the mysteries and beauty below the surface or help the marine biologist identify endangered wildlife. The jewel of the UNESCO biosphere reserve is undoubtedly Hanifaru Bay, the place where â€“ in season â€“ the worldâ€™s largest groupings of manta rays can be seen. This is also the place for whale shark spotting. Snorkelling with these peaceful ocean giants is an unmissable experience. The season runs from June to November each year and sightings depend on many factors such as tide times, moon phases and currents. This ocean country stocked with plentiful fish calls to anyone with the soul of a fisherman. The big game fishing boat can take you out to the high seas looking for wahoo, sailfish, swordfish, giant trevally or marlin for the catch and release programme. Alternatively, let the guides show you the local way to fish by hand from a traditional Maldivian fishing boat. With the UNESCO biosphere reserve and the world-famous Hanifaru Bay on the resort's doorstep, this is a great opportunity for you to learn more about the incredible wildlife in the area from the resident marine biologist. Here you may discover what makes whale sharks tick, why manta rays dance, what makes dolphins smile and help with identification and conservation practices. 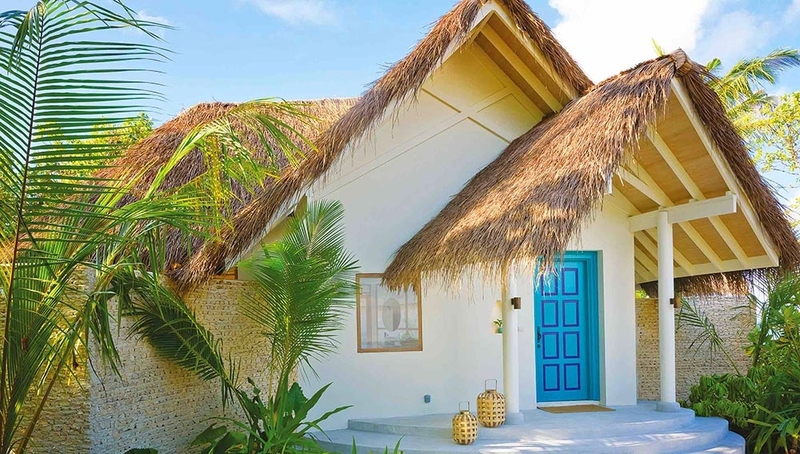 Take a trip to a local island and see what life is really like in a Maldivian village or sail away to your own privated deserted sandbank where a feast awaits. Cruise with dolphins at sunset with champagne and canapes on board one of the luxury craft or just set sail under the starry night skies and be at one with the universe. Water babies will love the collection of non-motorised watersports, which include kayaks, windsurfers, catamarans, stand up paddle boards (SUPs), Zayaks, and of course snorkelling equipment which can be used free of charge during the stay. While the beauty of the Maldives is breath-taking, what youâ€™ll find below the surface is even more moving. The experienced diving team have the keys to the best dive sites in the atoll and welcome everyone, from novices making their first dive to experts logging their 1000th dive. Milaidhoo has a five star PADI dive centre that offers house reef diving, boat diving, private diving, night diving, fluo night dives, Manta Ray diving and nitrox. PADI Five Star Dive Resorts are committed to providing quality diver training and continuing education programs that include dive experiences and environmental awareness. 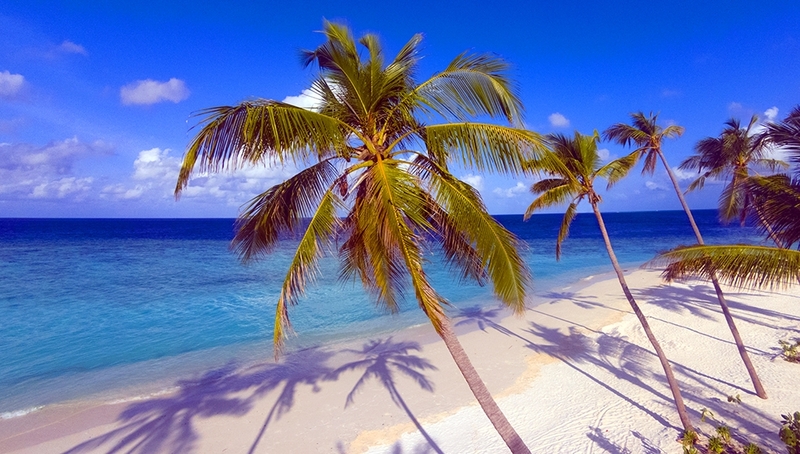 â€‹This is where youâ€™ll feel a million miles from everyday life. Youâ€™ll discover inspiring moments that enrich your life and excite your spirit of adventure. Donâ€™t just go fishing: instead join a Maldivian fisherman and learn how itâ€™s done here. Donâ€™t just go on an excursion; instead let a local take you by the hand and guide you through our culture and history. Donâ€™t just do a cooking class; accept chefâ€™s invitation to pick some local herbs with him and create a new dish together. Donâ€™t just drink cocktails; join the sommelier or bar tender on a tasting class and see if you can concoct something good enough to make it onto the drinks menu. Milaidhoo is serious about food, focusing on authentic, light food with clean flavours. Three restaurants and two bars are designed to appeal to your senses, offering outstanding dining in wonderfully informal settings. No shoes required. Ever. 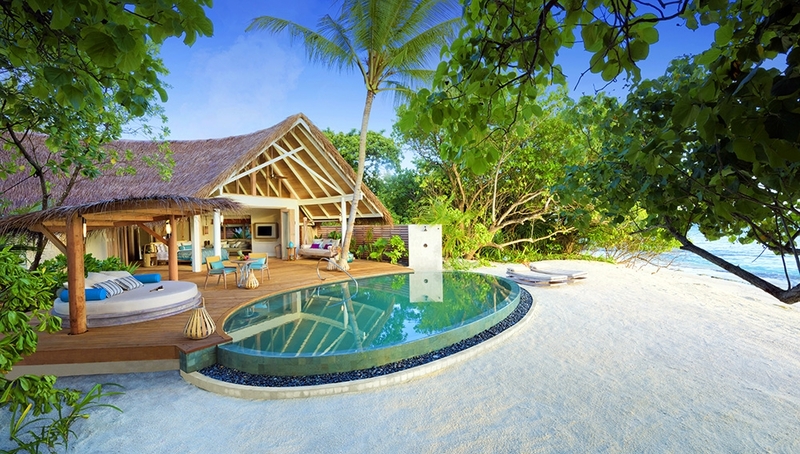 Milaidhoo offerS meaningful and memorable experiences. As part of that, The Milaidhoo Gourmet Plan is a dine-around meal plan offering outstanding dining and drinks throughout the stay. Enjoy your daily breakfast at leisure and follow it with an indulgent a la carte lunch at either the all-day dining restaurant or any restaurant open during the day. Then smoothly move on to an a la carte dinner in either the all-day dining restaurant or grill. Youâ€™ll also be invited to enjoy dinner at the signature restaurant once every four days and take a table at any weekly events. To ensure you never go thirsty, all day long youâ€™re welcome to enjoy international and premium brands of spirits, beers and cocktails from the selection as well as fresh juices, soft drinks, mineral water, teas, coffees, milkshakes and smoothies from the selection and a premium selection of wines, hand-picked by the resort sommelier. On the menu youâ€™ll find a carefully curated selection of dishes designed to please. If youâ€™re craving something different, simply let the chefs know what you fancy and it will be their pleasure to make it for you. Open 24-hours. The infinity pool overlooks the ocean but wouldnâ€™t it be even better if it came with cocktails, something to nibble on and a tempting drinks list? Enjoy the poolside menu of the freshest of fresh juices, infused waters, cocktails and light meals, such as gourmet pizzas from the wood-fired oven; bento boxes; fresh salads; sandwiches etc. The fun doesnâ€™t stop when the sun goes down; find yourself a sun lounger and watch the area transform into a laid-back chillout lounge. Open from 09.00 until late night with light meals available between 12.00 and 18.00 every day. Hereâ€™s the tropical breakfast youâ€™ve always dreamed of: sitting on the deck by the ocean as the team delivers wave after wave of treats to your table. For lunch and dinner the style remains casually comfortable with international dishes perfectly presented from the a la carte menu. Here, the key words are fresh, flavourful and friendly. Open for breakfast 07.00 - 10.30), lunch (12.00 - 18.00) and dinner (19.00 - 22.30). This beachfront grill is where youâ€™ll find fine cuts of meat, fresh local fish and seafood, simply cooked and beautifully presented. We think several visits will be required including at least one evening at the teppanyaki table. This is where youâ€™ll find barefoot informality at its best: the chef will ask what you feel like eating and cook accordingly. Easy, simple, no fuss. Open for dinner daily from 19.00 until 22.30. Perched on stilts over the lagoon, the signature restaurant is shaped like a dhoni (a traditional Maldivian sailing boat). Guests dine on the â€˜deckâ€™ of the restaurant where, underneath a stunning Maldivian sunset, the team of chefs deliver an island influenced menu of locally inspired and sourced dishes. Thereâ€™s also indoor seating in air conditioned comfort where you can watch the sealife below through glass floors. Expect to find seafood and traditional local flavours intelligently reinterpreted for the 21st century. Open for dinner daily from 19.00 to 22.30. And breathe . 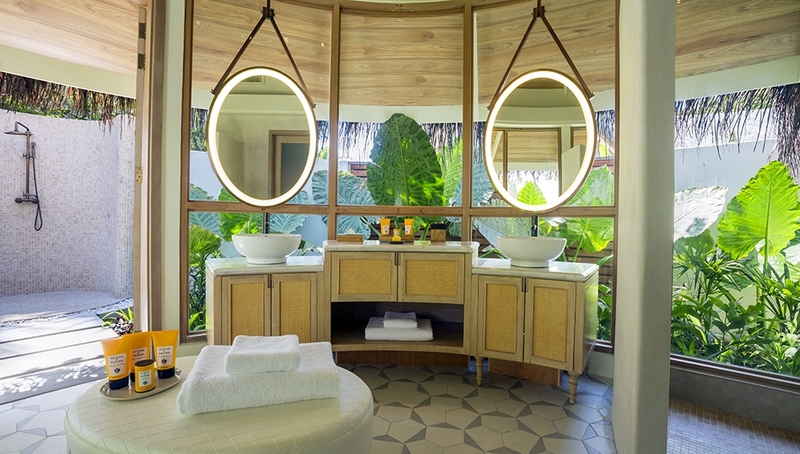 . . blissful relaxation for body and soul takes place in the four over-water treatment suites of the spa where the scents of coconut, lime, sea salt and herbs soothe you into perfect serenity. 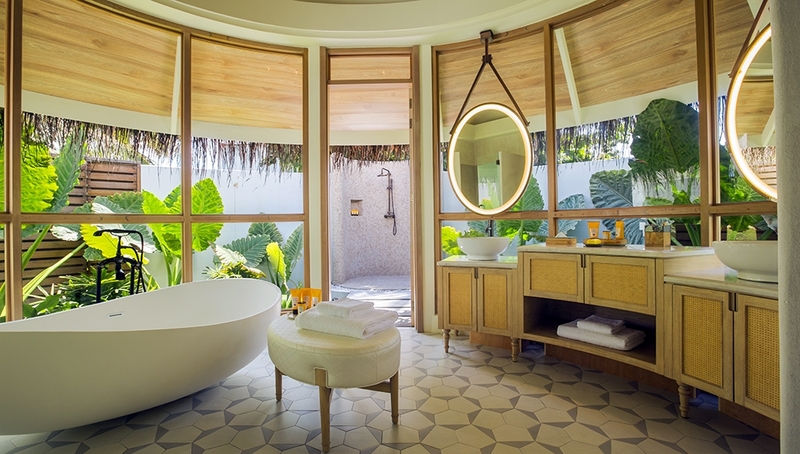 Here, the spa is inspired by the ancient healing traditions of the Maldives using local herbs and plants. An open-air pavilion hosts complimentary daily yoga or meditation sessions where all you have to focus on is your mind, body and soul.